When the long-awaited school funding simulations were released Friday by state Reps. John Patterson, D-Ashtabula, and Robert Cupp, R-Lima, for their Fair education funding plan, people didn’t really know how to respond. Yes, it called for an annual spending increase of $718 million statewide for schools. But did Ohio’s suburban districts need to swallow up more than 1/3 of that increase while the state’s biggest urban districts only got 5 percent of the increase? And flat funding Northern Local in Perry County – the district that originally sued the state over its failure to properly fund education? How is that “fair”, as the plan’s authors claimed? Something didn’t seem right. The formula Cupp and Patterson talked about made sense. Figure out what students need. Then fund it. The elements they picked (teachers, mental health, etc.) all made sense. So why were wealthy, suburban districts getting more than 1/3 of the increase? One explanation is that Ohio has held down increases in suburban districts through so-called “gain caps” for years. This allowed the state to continue investing in districts that couldn’t raise local revenue – not enough state investment there, by the way, but this Robin-Hooding has happened for decades. So if you’re eliminating gain caps – one of the hallmarks of the Cupp Patterson plan – you’re going to see large increases in districts that have been capped for years. In many ways, you are essentially making up for 30-40 years of Robin Hooding. Ten years ago, I was in the exact same position as Cup and Patterson. I was the chair (they are co-chairs) of the Primary and Secondary Education Subcommittee of the House Finance and Appropriations Committee when then-Gov. Ted Strickland introduced the Evidence Based Model of school funding – the state’s first real attempt to cost out education and pay for it since the Ohio Supreme Court ordered the state to do so in 1997. In much the same way as Cupp-Patterson, the original EBM initially poured millions into wealthy, suburban districts while doing much less, relatively speaking, in poorer districts. Yet by the time the formula left the House and eventually became law for a couple years, the plan did the best job of distributing revenue to the most needy districts the state had ever seen. And it won the prestigious Frank Newman Award from the bipartisan Education Commission of the States. I have always contended that the reason the Star Wars prequels failed to garner the widespread love of the original three was because the second prequel didn’t have Han Solo (or a character like him) – a wisecracking, street smart character who didn’t quite buy all this Jedi/Force/Destiny stuff. He was grounded in the real world. He was the guy audience members who weren’t buying the magical part of the movies could relate to. 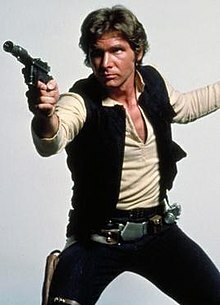 You didn’t need to believe in the Force to believe in Han Solo. Because Han Solo was us. The EBM’s Han Solo was the Education Challenge Factor – an index that calculated a school district’s extra-curricular challenges (and I don’t mean football teams). It took into account a district’s relative poverty and its parents’ educational attainment level – what we’ve known for years is the single most important determinant of a student’s success. Those were merged into a number that we applied to many of the formula elements. Why did we decide to apply the ECF to the formula elements? Because it’s hard to find, for example, teachers who want to teach in districts where the parents don’t value education that much and will more likely impede than support learning. Likewise, it’s easier to find those teachers in wealthier districts with more supportive parents. We applied it to many of the other formula elements, but that's the reason why. It's generally harder to overcome poverty and other barriers in districts with more of it. The ECF did a lot of the heavy lifting for the EBM – leveling out a lot of the original inequities in the formula. 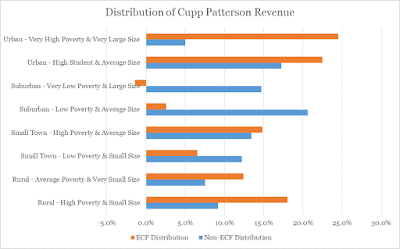 The Cupp Patterson formula doesn’t have a similar mechanism to account for the more difficult challenges districts that are poor and whose students don’t have much support from parents face in finding talent and overcoming those barriers, especially in districts that are the most challenged. So, for example, the Cupp Patterson plan assumes it will be just as easy to find the mental health professionals the formula envisions in Olentangy, Cleveland and New Boston. And those professionals will be equally successful in all those places. That’s probably not an accurate assessment. 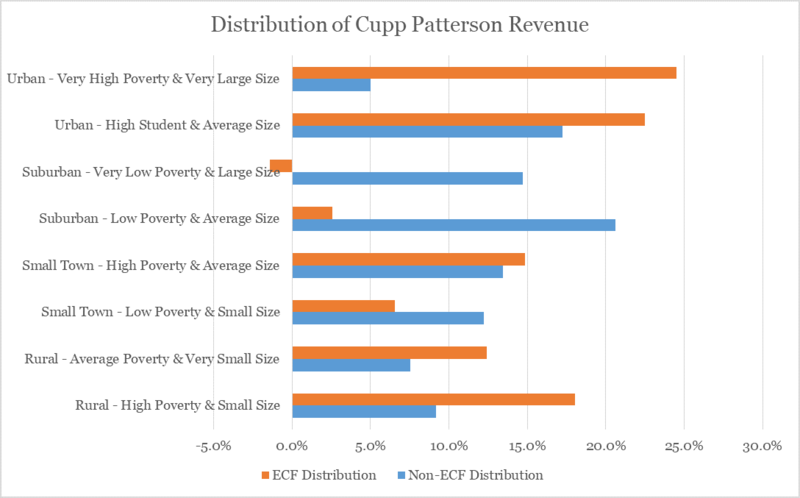 What effect would the ECF have on the Cupp Patterson plan? I’m not going to use dollar figures here because I don’t know which elements of the formula the authors would want to apply it to. And I’m using ECF figures from 10 years ago. I don’t want to suggest that Cupp and Patterson have to figure out how to find even more money than they currently have. What you’ll see is that instead of only receiving 5 percent of the formula’s benefit, the state’s Big 8 Urban districts (Akron, Canton, Cincinnati, Cleveland, Columbus, Dayton, Toledo and Youngstown) would see about ¼ of the benefit with an ECF. Likewise, poor, rural and small town districts would see about 1/3 of the benefit. Meanwhile, the state’s wealthiest suburban districts would see a small bump, or even a slight cut, depending on the category. I want to be extremely clear: I am not saying this is how the distribution should look. What I am saying is that this is a lot closer to what a fair distribution resembles. And since this is being dubbed the “Fair” education funding plan, it would appear that an ECF-like mechanism could significantly improve its fairness. As this formula works its way through the legislature, it is important to realize that the funding simulations released Friday will change. That’s a given. And there are major challenges to find the additional revenue the plan calls for. The only way to ensure that the most benefit goes to the most in need of those resources is to do what the Cupp Patterson plan states as a goal – develop a fair education funding formula. The current plan does the best job since EBM of calculating the elements of student need. What the plan is missing is Han Solo -- something to bring everyone around to it. But there’s still time to release him from the carbonite. You just have to march into Jabba’s Palace and do it.